Festoons: the baggage you don’t need! Malar Festoons are the baggy pouches that form under the lower eyelids and on the upper cheek. I have been treating them with laser resurfacing for the last 15 years. Festoons are a result of numerous causes including sun damage to the skin, fat loss of the cheek area, periorbital changes of skin, muscle and fat. They are also caused by a back up of the lymphatic drainage of this area which causes the tissue to become boggy. 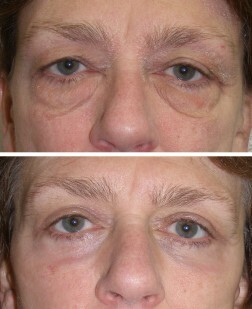 The net result is crinkly skin or pouches that make us look old and tired. Before the advent of laser technology, festoons were often treated by surgical excision, which of course left a scar. Other treatments that were supposed to improve festoons have been disappointing. I have used various types of lasers on this region (CO2, Erbium, Nd:YAG, KTP) and have personally had the best results with the CO2 laser. No other laser has been to shown to produce as much skin tightening or new collagen formation as the ultrapulsed CO2 laser. I believe it remains the gold standard in skin tightening. Although other lasers may claim to produce results with less downtime than the CO2, the result is often less or multiple treatments are required. In reality, the way the procedure is performed and the experience of the surgeon are the most important variables in terms of the best result. Experienced laser surgeons know how aggressive they can be with the skin resurfacing and yet not produce scarring. Good results can be obtained using CO2 and Erbium lasers. The above patient was treated by Dr. Niamtu with upper and lower blepharoplsty and CO2 laser to the festoons. Although festoons can be treated as a sole procedure, most patients that are having this area treated also benefit from upper and lower eyelid surgery as well. My most common combination of procedures to rejuvenate this region is transconjunctival blepharoplasty on the lower lids. This procedure does not involve a visible scar and is also safer in terms of not pulling down the lower lids. Instead of cutting skin off of the lower eyelids, the wrinkled skin is treated with the laser and the results are immediate. You can actually see the wrinkles disappearing as the laser contacts the skin. I prefer to treat the lower lids when I treat festoons as the aging process actually represents this entire area. More so, I encourage most patients to perform the laser treatment on their entire face if they desire more comprehensive rejuvenation. By treating the entire face, the patient does not have to worry about the festoon skin being a different color or texture if that is the only area treated. As most patients that have festoons need their lower lids treated, the same can be said about their upper lids. It is very common to rejuvenate all four lids and the festoons at the same procedure. 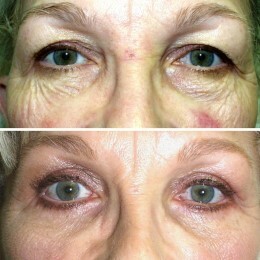 In addition to improving malar festoons, the CO2 laser also revolutionized cosmetic blepharoplasty (eyelid tuck) as the surgery can be performed in much less time with no bleeding. That is not a misprint, there is literally no bleeding. During the procedure of operating of 4 eyelids, the total blood loss can be measured in a single Q Tip. Less bleeding means faster healing, less bruising and less pain. 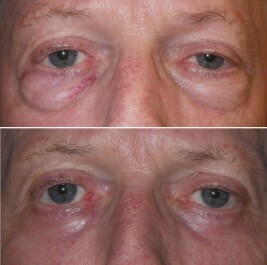 Those surgeons who have been using lasers for blepharoplasty can affirm these statements. Dr. Niamtu has performed over 5,000 eyelid surgeries with the CO2 laser since 1996 including festoon treatment and full face laser skin resurfacing. In addition, he has written numerous articles and text book chapters on laser treatment. 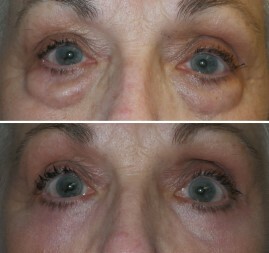 This patient was treated by Dr. Niamtu with lower transconjunctival blepharoplasty and lower periorbital laser resurfacing.